Jane Horrocks, youngest of three children, was born Barbara Jane Horrocks in Rawtenstall, Lancashire, the daughter of Barbara (née Ashworth), a hospital worker, and John Horrocks, a sales representative. She trained at the Royal Academy of Dramatic Art with Imogen Stubbs and Ralph Fiennes and began her career with the Royal Shakespeare Company. She first drew critical notice for her performance in the 1990 film Life is Sweet and became a household name with the role of Bubble in Absolutely Fabulous, in which she also played Katy Grin in the last two seasons of the series. While working on Road, a play directed by Jim Cartwright, Horrocks warmed up by doing singing impressions of Judy Garland, Shirley Bassey, and Ethel Merman, among others. Cartwright was so impressed with her gift for mimicry he wrote the play The Rise and Fall of Little Voice to showcase her talent. She was nominated for the Laurence Olivier Award for Best Actress for her performance in the 1992 West End production, directed by her then-boyfriend Sam Mendes. She reprised her role in the 1998 screen adaptation, which earned her nominations for the Golden Globe Award for Best Actress - Motion Picture Musical or Comedy, the BAFTA Award for Best Actress in a Leading Role, the Satellite Award for Best Actress - Motion Picture Musical or Comedy, the Screen Actors Guild Award for Outstanding Performance by a Female Actor in a Leading Role - Motion Picture, and the British Independent Film Award for Best Actress. In 2000 she released the CD Further Adventures Of Little Voice, again singing in the style of her favorite diva. The recording includes duets with Ewan McGregor, Robbie Williams, and Dean Martin. Horrocks collaborated once more with Robbie Williams the year afterward, for a cover of the Bobby Darin song "Things" on Williams's album Swing When You're Winning. In addition to Road and The Rise and Fall of Little Voice, Horrocks has appeared on stage in Ask for the Moon (Hampstead, 1986), A Colliers Friday Night (Greenwich, 1987), Valued Friends (Hampstead, 1989), The Debutante Ball (Hampstead, 1989), Our Own Kind (Bush, 1991), Deadly Advice (Fletcher, 1993),Cabaret (Donmar Warehouse, 1994), Macbeth (Greenwich Theatre, 1995) and Absurd Person Singular (Garrick Theatre, 2007). Her last West End appearance was in Sweet Panic, the 2003 Stephen Poliakoff drama in which she portrayed a neurotic mother locked in a battle of wills with her disturbed son's psychologist. She is scheduled to star in The Good Soul of Szechuan at the Young Vic in 2008. Horrocks' voiceover talents have been used on the big screen in films like Chicken Run (2000), Christmas Carol: The Movie (2001), and Corpse Bride (2005), and on radio as Fenchurch in the audio adaptation of Douglas Adams' popular science fiction series The Hitchhiker's Guide to the Galaxy for BBC Radio 4. Horrocks' other notable television credits include Bad Girl, Boon, Heartland, Hunting Venus, La Nonna, Leaving Home, Never Mind the Horrocks, Nightlife, Wyrd Sisters, The Foxbusters, Red Dwarf, Some Kind of Life, Suffer the Little Children, The Storyteller, The Garden, Fifi & the Flowertots, and Welcome to the Times. She was the subject of an episode of the genealogy documentary series Who Do You Think You Are? in 2006. That same year she played the title role in The Amazing Mrs Pritchard, a drama about an ordinary woman who is elected Prime Minister. It was shown in the United States on PBS in autumn 2007. She frequently is seen in the audience of Strictly Come Dancing, of which she is a fan. 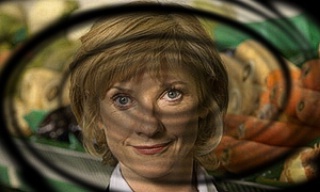 For ten years, Horrocks appeared with Prunella Scales in a series of commercials for the UK supermarket chain Tesco. Horrocks was in a relationship with singer Ian Dury for more than a year in the 1980s. Horrocks is married to Nick Vivian. The couple live in North London with their children, son Dylan and daughter Molly.